If you would like to nominate a pet health professional for their exemplary commitment and care, please submit this form. The animal care and control field requires the strongest in character. Legacy Animal Foundation wants to further the positive image of animal care and control professionals and agencies by recognizing these “friends” of animals for their dedication and service. If you know anyone in the animal control service who deserves this nomination, please submit this form. These remarkable individuals give tireless dedication that doesn’t wane by the endless need for more. Rescue and shelter workers go to incredible lengths to help a forgotten animal. Legacy Animal Foundation wishes to recognize these deserving and courageous legacy leaders who work so hard to make life better for the many lonely and confused animals who don’t yet–or may never–have a home. To nominate one of these amazing volunteers, please submit this form. Next to owning a pet, some find fostering a rewarding and fulfilling way to give an animal a chance to live and be loved in a home environment while opening much needed space in shelters. These admirable and committed individuals open their homes and their hearts to many … smiling and crying at the same time when they find their forever home. Legacy Animal Foundation wants to see these extraordinary caretakers recognized for their generous and loving hearts towards animals. If you know a pet foster parent who goes above and beyond to give an animal a loving home, please submit this nomination form. Being a pet owner in not only a huge responsibility, it is a privilege. Those who make the decision to become a responsible pet parent make a commitment to invest endless time and money to their pet’s care and well-being. Legacy Animal Foundation wishes to recognize those who realize that owning a pet is not for temporary amusement, but rather a lifetime commitment and who provide their pet with the life they deserve. To nominate a pet parent who exhibits the ultimate in pet parenthood, please submit this form. The future of animal welfare rests in the hands of our youth. 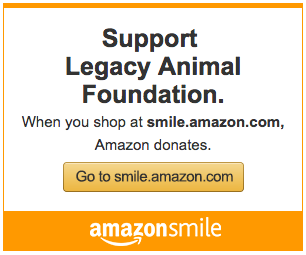 Legacy Animal Foundation is committed to celebrating a new generation’s passion for animal compassion. If you know a youth volunteer between the school grades 6-12 who demonstrate a commitment toward a better tomorrow for our animal friends, please submit your nomination.